Numaligarh Refinery and its township are well connected by air, road and rail. The nearest airport is Jorhat, 70 km away from NRL site. Indian Airlines and Jet Airways operate from/to Jorhat, four days a week. Road distance from Guwahati to Numaligarh is 250 km through NH-37 towards east. It takes around 5 hours by luxury coaches that operate daily in the morning and afternoon. The nearest railhead is at Furkating Jn, 35 km from NRL which is approachable by a hired taxi. Temperature ranges from 7 to 24 degree celsius during winter and 18 to 35 degrees celsius in summer. Golaghat, one of the oldest erstwhile subdivisions of the northeast Indian state of Assam, created during the pre-independence era in the year 1848, has become a full fledged district (139 years later) on 23rd October, 1987. Of late, Golaghat, a developing town with an unique lifestyle of all kinds of people is commercially expanding by leaps and bounds. It is located near the river Dhansiri which is the most famous and important river where Doyang, Nambor, Doigrung and Kaliyani are the four rivulets of Dhansiri. It is surrounded by districts and states like Nogaon Karbi, Anglong Jorhat and Nagaland. Tea is produced 20000 MT per year and there are more than 350 tea gardens in and around Golaghat and seeing such varied passion of natural beauties makes a person having a glimpse of it for the first time take a pause, in wonder and praise. Golaghat district has been attracting a large number of foreign and domestic tourists in the last few years for its famous Kaziranga National Park, Deopahar ruins (Numaligarh), Neghereting Siva Mandir, Garam Pani (hot spring), Uncle Robin’s Children Museum etc. 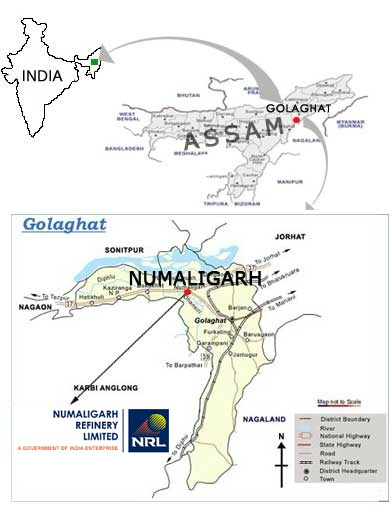 Numaligarh Refinery Limited (NRL) is the most recent and modern public sector unit. Kaziranga was declared as a reserved forest way back in 1908, a wild life sanctuary in 1950, National Park in 1974 and World Heritage Site in 1985. Of late, it has been recognized as one of the best managed parks. It is located at very advantageous and easily accessible position along the National Highway No.37 and so it has become a hot spot for the foreign as well as domestic tourists. Kaziranga National Park, a World Heritage Site, is famous for its one-horned rhino (Rhinocerous Unicornis). Tourists from India and abroad come here to see the wild life in its natural habitat. Apart from the rhino, there are elephants, wild buffalos, leopards and a host of other animals. It is also a paradise for many different rare and near extinct species of birds. Migratory birds from many parts of the world come here during the winter season. A wide variety of fresh water fish are also found in the Beefs (marshy areas) of the park. The park covers an area of 430 sq. km along the river Brahmaputra on the North and the Carbide Angling hills on the South. The National Highway 37 passes through the park area and tea estates, hemmed by tabletop tea bushes. One can even see the rhinos and wild elephants straying near the highway. Kaziranga is well connected by air, road and rail. The nearest airport is in Jorhat which is 96 km. Kaziranga by road from Guwahati is 217 km. The nearest railhead is at Furkating which is about 75 km. Temperature ranges from 7 to 24 degree Celsius during winter and 18 to 35 degrees in summer. Tezpur, known as Sonitpur (city of blood) of Puranic fame, is associated with the legend of princess Usha, the daughter of King Bana and prince Anirudha, the grandson of Lord Krishna for their eternal love and romance. The great mythological war believed to have been fought between Hari (Lord Krishna) and Hara (Lord Shiva) and as a result the whole city was said to have been drenched in blood, hence the name. Situated on the north bank of the majestic river Brahmaputra, Tezpur town is of magnificient scenic beauty and exquisite archaeological ruins. It is the headquarters of Sonitpur district and is considered to be one of the most beautiful towns of the state . In 1942, for the first time in entire British India, the tricolour (Indian flag) was hoisted in the police station at Gahpur, a quiet town under Sonitpur district. Fourteen year old Kanaklata braved British bullets and died holding the national flag aloft. Sivasagar, earlier known as Rongpur is 365 kms east of Guwahati and 110 kms east of Numaligarh. It was the capital of Ahoms, who ruled Assam for more than 600 years. They ruled Assam virtually uninterrupted for six centuries until their kingdom fell to the British in 1862. It is famous for a 257 - acre tank, that is at a higher elevation than the rest of the town, with three temples on its banks - Shiva dol, Vishnu dol and Devi dol. Shiva dol , which draws large crowds at Shiv Ratri and also believed to be the tallest Shiva temple of India. Its height is 104 feet above sea level. Sibsagar is the leading tea and oil producing town. Joysagar, 5 kms off the Sibsagar town is said to be the biggest man-made lake in the country and is spread over 318 acres of water on the edge of the town. A new addition is the Ahom Museum on the bank of the Joysagar tank which stores artifacts of the rulers, including swords and clothes, manuscripts, goblets and platters. Charaideo is another place of interest and is about 28 kms east from Sibsagar town. It was the capital of the Ahom Kings, built by Sukapha, who was the founder of the famous Ahom Kingdom in Assam. Charideo is famous for Maidums or burial vaults of Ahom Kings and the members of royal families. It resembles to some extent the pyramids of Egypt. Gargaon, at one time was the principal capital of Ahoms built by the king Suklengmung which lies 13 kms east from the Sibsagar town. It is famous for Kareng Ghar, Talatal Ghar and Rang Ghar. These historical monuments were built with 18th century architects by King Rudra Singha during 1696-1714 AD was the military station of the Ahom Kings. It is a seven storied palace having three storied underground-known as Talatal Ghar and the upper storied known as Kareng Ghar. The entire structure is of historical and architectural interest. Sibsagar is also famous for Rang Ghar and Namdang stone bridge. Rang Ghar amphitheatre was built by King Pramatta Singha. This two storied oval shaped pavilion is one of the largest of its kind in Asia. The Namdang stone bridge is carved out of a single boulder hundreds of years of age, over which a busy highway still runs today.